An advanced high performance system suited to QC and research laboratories performing gradient HPLC applications with UV-Vis detection for routine, trace and ultra-trace analysis. An optional IEEE communication interface is also available to provide integrated digital instrument control from the data station for fully automated GLP/GMP compliance. Comprises LC1150 quaternary gradient pump, LC1210k Programmable Dual wavelength detector, LC1460 On-line Degasser, Rheodyne 7725I Injector with 20 mL sample loop, Injector mounting bracket, EZChrom Chromatography Management System, IBM Pentium PC, 1 Litre Solvent bottle with cap and tubing, HPLC fitting kits (PEEK). An advanced high performance system suited to QC and research laboratories performing gradient HPLC applications with UV-Vis detection for routine, trace and ultra-trace analysis with a high sample throughput and/or automation requirements. The system provides integrated digital instrument control from start to finish for fully automated GLP/GMP compliance. Comprises LC1650 Advanced Autosampler, LC1150 quaternary gradient pump, LC1210k Programmable Dual wavelength detector, LC1460 On-line Degasser, LC1120/1150 column oven, LC1445 System Organiser, EZChrom Chromatography Management System, EZChrom IEEE Communication Kit, IBM Pentium PC, Four 1 Litre Solvent bottles with caps and tubing, HPLC fitting kits (PEEK). An advanced high performance system suitable for QC and research laboratories performing method development, gradient or isocratic (dial-a-mix) HPLC applications with detection other than UV/Visible. The LC1650 Advanced Autosampler is included to satisfy high sample throughput and/or automation requirements. The system incorporates a high resolution A/D interface and provides two signal channels (expandable to four channels) for the seamless integration of your choice of detector(s). 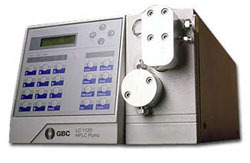 Comprises LC1150 quaternary gradient pump, LC1650 Advanced Autosampler, LC1460 On-line Degasser, EZChrom Chromatography Management System with A/D interface, EZChrom IEEE Communication Kit, IBM Pentium PC, Four 1 Litre Solvent bottles with caps and tubing, HPLC fitting kits (PEEK). 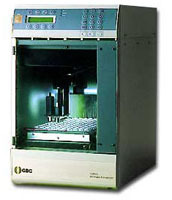 GBC provides a comprehensive range of modular detectors suitable for connection into existing HPLC systems or, combined with other GBC modules, as fully integrated systems under single computer control. The high performance LC1200 is designed for standard HPLC applications requiring UV-Vis detection, and most suitable for QC and educational laboratories, offering a level of performance and versatility one would expect from much higher priced models. Flexible operation at single wavelengths within the range of 190–600 nm makes for versatility. 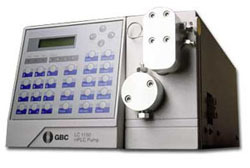 For example, rather than being restricted to one or two wavelengths, you can use the LC1200 at 254 nm for the detection of aromatic compounds, improve sensitivity and selectivity for proteins, peptides, phenols and catecholamines at 280 nm, detect analytes of interest in the visible range, or monitor nitrate/nitrite and carboxylic acids at 200 nm. The LC1205k is a high performance fully-featured detector for all applications requiring UV/Vis detection. It provides an extended variable wavelength selection range from 190 to 740 nm. The micro-processor controlled stepper motor permits fast and accurate wavelength switching, low-noise dual-wavelength operation and high speed "on-the-fly" spectral scanning. A wide selection of flow cells is available for analytical, bio-compatible capillary and preparative assays. The LC1210k is a high performance fully-featured detector for all applications requiring UV/Vis detection. It provides an extended variable wavelength selection range from 190 to 740 nm. The micro-processor controlled stepper motor permits fast and accurate wavelength switching, low-noise dual-wavelength operation and high speed "on-the-fly" spectral scanning. A wide selection of flow cells is available for analytical, bio-compatible capillary and preparative assays. A refractive index detector is an indispensable universal detector which permits the identification of analytes not easily detected by UV detectors. The LC1246k uses a beam deflection design with microprocessor control of flow-cell temperature for exceptional sensitivity and high stability. Automatic compensation for baseline and peak fluctuations is achieved with patented electrical and auto-zero design. With a user-friendly keypad and LCD display, the LC1246k continuously monitors signal output and provides immediate visual feedback on detector performance and operation. For unattended operation, all detector controls can be interfaced with your integrator or data station. A high sensitivity scanning fluorescence detector for fluorescence, phosphorescence and chemiluminescence, the LC1255s uses high-efficiency holographic diffraction gratings optimised for high sensitivity at both lower and higher excitation wavelengths. Selectivity can be adjusted with selectable slit widths. The pulsed xenon lamp provides a high energy level across the UV/Vis spectrum 200 - 600 nm (200 - 900 nm Option) and produces no harmful ozone. A wide dynamic range is made possible by 20-bit digital electronics. Time programming of both excitation and emission wavelengths allows optimised sensitivity and selectivity, while automatic real-time scanning of eluting peaks helps identify optimum wavelengths. Up to sixty spectra may be stored for display on the LCD display or played back to an external collection system. Pre-aligned lamp and flowcell simplifies operation. Add LCEC capability to your existing HPLC system without major instrument re-configurations or user re-training. The LC1260 electrochemical detector provides enhanced detector performance in a robust and easy to use instrument. It adopts a patented Wall Jet Flowcell design optimised for high assay sensitivity, wide linear dynamic range, response stability and reproducibility. In LCEC the electrode surface is in direct contact with the test medium, resulting in gradual fouling of the electrode surface due to the adsorption of chemicals. The washing effect of the impinging jet made possible by the wall jet design improves electrode stability and precision with much-reduced down-time for electrode cleaning. The design also enables faster warm-up and equilibration. The detector utilises a modular, stackable design and can be readily integrated into existing HPLC systems. For reliable solvent conditioning for both isocratic and gradient applications, the LC1460 provides four channel on-line removal of interfering gases, particularly oxygen, ensuring continuous stable operation for high quality assay results. Dissolved gases are removed from the mobile phases as the solvents travel through tubular gas-permeable membranes within the degasser's compact vacuum chamber. Channels can be serially connected for further enhancement of the degassing efficiency for trace level analysis. The degasser allows non-stop unattended operation for higher laboratory productivity. Improved detection limits and baseline stability for UV, fluorescence and refractive index detection, improved pump flow performance, and the elimination of expensive helium sparging are some of the benefits. The LC5200 is a very high performance Photodiode array detector for HPLC. Precision optics provides high sensitivity, superior spectral resolution as well as high stability and a superb noise level of ± 0.8 x 10-5 AU for unsurpassed sensitivity, bringing new levels of accuracy to trace component identification, spectral elucidation and library searching. This very compact PDA provides the latest validation tools to support GLP/GMP. Full scan spectra can be continuously collected in the flowing analyte stream. The detector is equipped with both a deuterium lamp and a tungsten-halogen lamp to provide superior sensitivity over the 190 to 800 nm range and real time spectra using a 512 element photodiode array. Full spectral information can be provided at any time during the chromatographic run. Chromatograms at individual wavelengths or three-dimensional plots showing absorbance against both time and wavelength can also be generated. The LC5200 performs an automatic wavelength accuracy check at four wavelengths as part of its validation procedure.